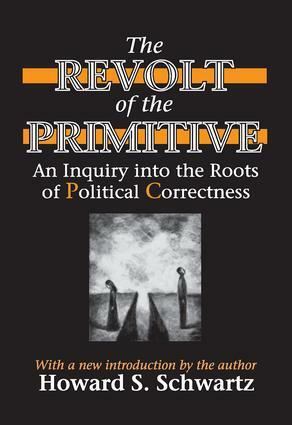 The Revolt of the Primitive explores the psychological dynamics of political correctness and gender warfare. Author Howard Schwartz argues that perceptions of men as abusers, sexual predators, and deadbeat dads have become firmly entrenched in our culture due to fantasy rather than solid, objective facts. This volume delves into the psychological forces that have given rise to these ideas and reveals the hard facts about men and women in our society.Schwartz illustrates how feminists have taken the most vulgar stereotype of men and pronounced it a universal and inviolable cultural norm. He then examines his thesis in the context of work and the work organization, discussing how the feminization of the workplace has been driven by the archetypal need to remake it into a maternal world, banishing the limitations that shape survival and progress. He examines the traditional sexual division of labor and its alleged oppressive nature. He also discusses the psychological forces that drive the idea of placing women in combat roles in the military.Howard S. Schwartz is a professor of organizational behavior in the School of Business Administration at Oakland University in Rochester, Michigan, and is one of the founders of the International Society for Psychoanalytic Study of Organizations (ISPSO).